On your next business trip to the US, your American colleague may ask you to join them for dinner. There are many kinds of restaurants that you may be invited to - chain restaurants, local restaurants, diners, sit-down restaurants or fast food restaurants. The first thing to keep in mind, especially coming from Kerala is upon entering, look for one of these below signs - seat yourself, or wait to be seated. 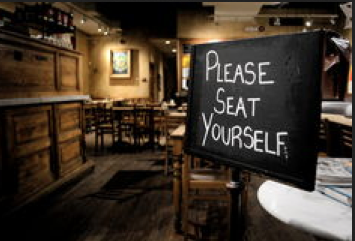 If there is a sign requesting for you to wait to be seated, typically there will be a small desk or small, tall table with a host standing behind it, asking you for your name. He or she will write your name and ask you to wait. Depending on how many people are waiting in line before you, you may be given a beeper. When your name is called or your beeper rings or lightens up, find the host who will guide you to your table. A different person will be your waiter in most cases. These are typical ways we wait for our table in smaller cities. In bigger cities or fancier restaurants, there may be other approaches to wait to be called to be seated at your table. If it says to seat yourself, leisurely stroll around and find a table. If it is crowded, do not run and take a table that another person is sitting at (as sometimes happens in Kerala). Wait for another table to open up, so you and your party can sit alone. If by mistake you sit at a table where another patron is sitting, simply apologize and move to another table. It's important to make eye contact with those around you and be aware of who is around you. If you find some difficulty in finding a table during peak hours, please find a restaurant employee to help you. In most fast food restaurants, you will approach the counter to place your order. Be ware that they will speak very fast, as orders must be given, placed and delivered within short periods of time, like three to five minutes. Be ready with your payment of credit card, debit card or cash. In most fast food restaurants, you will seat yourself. The same rules apply for seating yourself in fast food restaurants as noted above. be scared by the fact it says "bar." Some restaurants, like Olive Garden, shown in the video below, will have a bar section. When entering the restaurant, the host will take your name and you will wait to be seated (that is not shown in the video). If the establishment is very busy, and all the tables are full, but the bar section is empty, the host or hostess may ask you if you'd like to sit or wait in the bar until your table is empty. If you have children with you, it's ok to pass. If you go into the bar section, you do not need to buy alcohol. The bar section can serve you food just like you would get in the main seating area, but the tables may look different. You may sit at a "bar" with stools, or higher, round tables, or there will be less seating than in the main area of the restaurant. Note, smoking is not always allowed in all bar sections. Please ask the staff before lighting up. The two videos below showcase some scenes of eating in restaurants in the US. Olive Garden is a chain restaurant, known for Italian food. When you enter, you would wait to be seated. If it is busy, they may suggest to sit or wait in the bar and have snacks until your table is ready. When you sit at a table, they may suggest wine with your meal. It is acceptable to decline. They may offer a free sample. Free samples do not suggest you need to buy a glass, but if you desire, you can. The below video is more of an American English tutorial that will guide you on some common expressions, questions and pleasantries you can use in American restaurants. Also, notice some common phrases or greetings used by wait staff in common eateries. Note that the word "hotel" is used in many parts of south India to refer to a restaurant. A hotel in the US is an establishment for sleeping, rarely for eating. Avoid asking your American counterpart to "join you in a hotel" for lunch. This doesn't have a good meaning in the US culture. Instead ask, "Shall we go out for lunch today?" And, if someone asks where did you eat, don't say, "We went to the hotel." Instead, say, "We ate at the restaurant." Or mention the name of the restaurant, "We went to Olive Garden today." If you are out with your colleagues or American friends, take the initiative to open the door for them. If anyone is following through the door behind you at a restaurant or in the office, or anywhere, hold the door open for them. This is one behavior that in the US if you do it (with eye contact and a smile), people will be happy, but if it's not done, it will be problematic. Please feel free to share your experiences eating in the US, and tips you have for foreigners or expats visiting the US. Does your company relocate employees to the U.S. or assign them to short term engagements in the U.S.? If yes, we can help prepare your team for success on their business trips to the U.S. Contact us for more information.